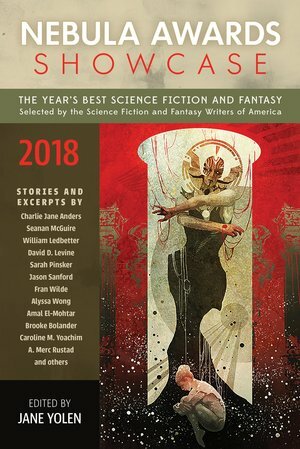 The annual Nebula Awards Showcase anthologies, which collect the Nebula Award nominees and winners, are edited by a revolving committee of editors, and that means the criteria used to select the fiction varies every year. I think this is a great idea. Essentially, each year it gives editorial power to a new individual to select which stories to showcase. The winners are always included, of course, but picking between the nominees (especially in the novella category, which frequently would fill one and a half anthologies all on its own) is a challenge, and it needs a strong editorial hand to make tough decisions. If you’re looking for a Best Of collection that encapsulates some of the finest science fiction from last year, it makes a splendid choice. Here’s the complete Table of Contents. Nebula Awards Showcase 2018 was published on August 7, 2018 by Pyr. It is 287 pages, priced at $18 in trade paperback and $9.99 for the digital version. The cover is by Galen Dara. See all our recent coverage of new fantasy here. This is actually the second time that the novella winner wasn’t presented in full. In NEBULA AWARDS SHOWCASE 2005, edited by Jack Dann, Neil Gaiman’s “Coraline” also appears only as an excerpt. It’s regrettable, but as you point out, some novellas are just too long to allow room for much else. Your grasp of Nebula history far surpasses mine! I bow to your superior knowledge. Thanks for the correction. Coraline is over 200 pages in paperback, which has got to be about as big as a novella gets. Seems like an obvious choice to cut that one. Plus, “Every Heart a Doorway” is kind of a weak story. (And very long.) Next to “Seven American Nights” … one of the great novellas in SF history … well, it would be sad. To be sure, much as “The Persistence of Vision” was loved at the time (and I suppose probably still is) I have to suspect Pohl chose “Seven American Nights” partly as a rebuke to the voters — you could have chosen this incredible Wolfe story, and instead you chose this? That’s pretty much the sense I got as well. It’s not the first time I’ve sensed a subtle rebuke in the TOC for a Nebula anthology! John, I have little grasp of Nebula history—certainly no more than you—but I did take the trouble to list all the stories that have appeared in the series, so I can easily generate useless trivia. For example, there is one story that has appeared, in full, in two different Nebula volumes. Can anybody guess what it is? I’ll post the answer about a day from now. I’m going to guess (without looking) that it must have been a story that won (or was nominated for) a Nebula, written by a writer later named Grand Master. Perhaps “Repent!, Harlequin, said the Ticktockman”? Your reasoning is impeccable, Rich! That was my line of reasoning too, Rich. But there’s several other reasons I can think of for a story to appear a couple of times. For ex, a Nebula-nominated story that was later expanded into a novel. Because it was the first to pop into my head, and because I really like it, I’m going to guess “Of Mist, Grass, and Sand,” by Vonda McIntyre. Credible guess, John, but it’s not the McIntyre, either. If there’s one more wrong guess, I’ll give the answer! First, I think the definitions of novella and novelette need revising. Regardless of word count, 200 pages is a novel in my book. It seems these days short stories – which used to be short, not the 40-50 pages some are now! – novelettes and novellas grow ever longer. Maybe we need another category between Novella and novel for these mammoth stories. Second, Though I buy several “Best of” SFF anthologies each year, including Gardner (sadly no more), Strahan, Horton, etc. in spite of overlap, I’ve given up on the Nebula sets for the very reason that the editor seems to do whatever they like and I don’t want excerpts in such an anthology. They might be better to produce two slimmer volumes, one for the shorter works and the other for…? You have some telling points. I also don’t like excerpts. A work of fiction is a work of art, and a work of art is created to be exactly the right length. If an author writes a 200 page novella, that’s the length she or he wanted it to be. An excerpt of 30 pages doesn’t give you what the author intended. You can’t just cut out the Mona Lisa’s face because you don’t have room for the whole painting. So I agree—I skip excerpts if they’re included in an anthology. I also agree that the traditional categories have created the possibility of awkwardly long novellas, which we are now seeing quite often because of electronic publishing. Before the era of electronic publication, most novellas tended to coalesce around a word count of about 22,500 words—not all that much above the novelette limit. Editors of print anthologies could usually fit one or two of those in. In fact, Gardner sometimes crammed in five or six novellas in his annual. Now, a lot of novellas are just too long. So I think the short fiction categories should max out at about 25,000 words, and because I love short fiction, I’d still like to see three categories up to that length. Then we can have a new category called “Short Novel”, running from 25,000 words to about 60,000. Beyond that, you’re running with the big dogs. The story that appeared twice in the Nebula Awards series is “The Listeners”, by James Gunn. It first appeared in NEBULA AWARD STORIES FOUR, edited by Poul Anderson, because the story had been on the final ballot for the award. Then it appeared again in NEBULA AWARDS SHOWCASE 2008, edited by Ben Bova, after Gunn had been made a Grand Master.